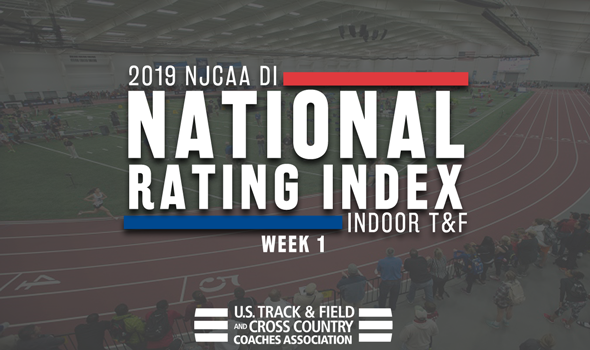 NEW ORLEANS – The first National Track & Field Rating Index (TFRI) for the 2019 NJCAA Indoor Track & Field season was released on Wednesday by the U.S. Track & Field and Cross Country Coaches Association (USTFCCCA) and two familiar programs kept hold of the top spot in the country. The men’s team from Iowa Central and the women’s squad from New Mexico JC have been selected as the No. 1 team in the nation to continue what has been top impressive streaks atop the charts. Iowa Central is looking for a three-peat while New Mexico is the defending champion as well. The 2019 NJCAA Division I Indoor Track & Field Championships will be held on March 1-2 in Pittsburg, Kansas on the campus of Pittsburg State University. Iowa Central continues its run atop the country, a spot that the program has held for 13 consecutive indexes dating back to the opening week of the 2016 season. The back-to-back defending national champions are looking for the three-peat this year and were the top selection with 318.43 points. The Tritons are a well-balanced squad who have gotten top performances out of Courtney Lindsey (top-ranked athlete in the 60 and second in the 200), Awet Yohannes (third in the mile), Caden Fenchel (third in the shot put) and Tyler Lienau (third in the weight throw). The No. 1 rating streak has ran over two calendar years and is the longest time spent atop the charts by a NJCAA program since official rating data started in 2015. It is the second year in a row that Iowa Central has opened in the top position. Coming in at the No. 2 spot was Cloud County (Kan.) CC with 296.60 points. The rating was the best received in school history, toppling the old best of 3 earned during the final index of 2017. The T-Birds are looking to improve on last year’s seventh-place finish and have seen top performances so far out of Santino Kenyi (leads the nation in the mile, second in the 3000 and third in the 5000), Louis Humbert (tops the country in the pole vault) and Peter Ackah (second in the triple jump). Slotting in at No. 3 was Barton (Kan.) CC with 280.37 points. Last year’s unit took third place at indoor nationals and like the two aforementioned teams, the Cougars are strong throughout multiple disciplines. Top athletes include Stephon Torrence (first in the nation in 60H), Kevin Nedrick (leads the shot put), Jermaine Francis (second in the high jump), Dartez Hamlin (third in the 200), Kenroy Williams (third in the 400) and Timothy Wilson (third in the long jump). Next up at No. 4 was Coffeyville (Kan.) CC after it picked up 277.72 points to tie a program best for highest mark received. Standouts so far have been Don’Drea Swint (leads the country in the 60), Jerrell Hunter (first in the 1000m), Brian Pittman (first in triple jump), Miles Marhofer (top in the weight throw) and Dodley Thermitus (third in the triple jump). Holding down the No. 5 spot was South Plains (Texas) with 188.87 points. The Texans have been led by Asani Hylton (first in the high jump), Holland Martin (first in the long jump), Andrew Bosquez (third in the 3000) and Deion Lightfoot (third in the 60H). The rest of the top-10 was rounded out by No. 6 Western Texas, No. 7 Monroe (N.Y.), No. 8 Trinidad State (Colo.) JC, No. 9 Iowa Western CC and No. 10 Indian Hills (Iowa) CC. It was a new program best mark for both Trinidad State and Indian Hills (Iowa) who each appeared in the top-10 for the first time in school history. New Mexico JC continues its streak atop the country as it was selected as the No. 1 team with 312.15 points. The defending national champions have held the top spot for sixth straight ratings dating back to last season. It is the longest a team has spent at No. 1 in NJCAA history, with official data dating back to 2015. The Thunderbird jump group has gone off to start the year as Kristal Liburd (first in the nation in the long jump and triple jump), Rushellee Jones (first in the high jump) and Monique Grant (second in the triple jump and third in the long jump) have all posted top performances. Other standouts include Raheema Westfall (first in the 200) and Demisha Roswell (second in the 60H). Starting the year in the No. 2 spot was Barton (Kan.) CC with 284.09 points to record a new program best. The Cougars have been led so far by T’Nia Riley (tops in the country in the 60 and second in the 200), Yoveinny Mota (first in the 60H), Latavia Maines (second in the shot put), Christal Mosley (third in the 400) and Kameliah Style (third in the weight throw). The 4×400 relay unit is currently the top team in the nation as well. Coming in at No. 3 was last year’s national runner up in Iowa Central CC after it picked up 241.90 points. The Tritons have been led by their distance group so far in Florance Uwajeneza (leads the country in the 3000 and 5000), Lilian Busienei (second in the 3000 and 5000) and Winrose Chesang (third in the 3000). Dijana Hammond is also currently the third-ranked high jumper. Iowa Central CC has yet to drop out of the top-three in rating history, a run of 19 consecutive indexes. Tying a program best was No. 4 Cowley (Kan.) after it recorded 176.68 points. The Tigers have seen top performances so far out of Sasha Elizondo (third in the 1000), Leshia Dickerson (third in the mile) and its DMR team (currently tops in the country). Rounding out the top-five at No. 5 was Iowa Western CC with 167.15 points. The honor of top performer of the Reivers so far has gone to Dorcas Gyimah who is third in the nation in the 60 and 200. The rest of the top-10 was composed of No. 6 Cloud County (Kan.) CC, No. 7 Monroe (N.Y.), No. 8 South Plains (Texas), No. 9 Highland (Kan.) CC and No. 10 Central Arizona. Cloud County (Kan.) CC and Highland (Kan.) CC set new program marks for best rating as neither school had appeared in the top-10 before.